Joseph-Jacques-Jean Chrétien was born on January 11, 1934, in Shawinigan, Quebec, Canada. He was the eighteenth of nineteen children (only nine of whom lived past infancy) born to Wellie Chrétien and his wife, Marie Boisvert-Chrétien. Shawinigan was a town built around pulp-and-paper mills, and the Chrétien family lived in an apartment that was owned by the mill where Jean's father worked. In 1939 Jean's mother became ill. He was sent to a boarding school, where he worked hard at getting into trouble and not studying—trying to get expelled so that he could go back home. Jean's father was a Liberal Party organizer in addition to working three jobs. Jean began attending Liberal rallies and working for the party at age twelve. After graduating from high school, he won a scholarship to Laval University Law School in Quebec City, Canada, adding to his income with summer work at the Shawinigan paper mill. He was admitted to the Quebec bar, earning the right to practice law there, in 1958, a year after marrying Aline Chaîne. In 1963 Chrétien was elected to Parliament from his home area of St. Maurice-Laflèche. When he took office he spoke barely a word of English, but he quickly caught the attention of Prime Minister L. B. Pearson (1897–1972) and Finance Minister Mitchell Sharp. They liked his quick mind, genuine Canadian patriotism, and commitment to a strong national government. Chrétien worked under Sharp as minister of state for finance, and he became minister of national revenue (income) in January 1968. Later that year Pearson was replaced as prime minister by Pierre Elliott Trudeau (1919–2000), and Chrétien was appointed Trudeau's minister of Indian affairs. He proposed a series of reforms to Canada's native people that met with much criticism. Chrétien found that he preferred to be where the cash was. He was president of the Treasury Board, 1974–76; minister of industry, trade, and commerce, 1976–77; and the first French Canadian minister of finance, 1977–79. When the province of Quebec elected a government that called for policies to give the province more independence, the federal government used Chrétien to make the point that people living in Quebec had real power in Ottawa, and that their problems could be solved in a national setting. convincing margin. 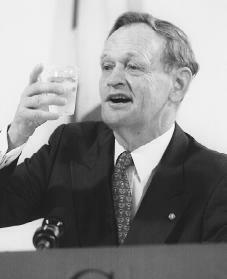 When Trudeau announced his retirement, Chrétien ran to become chief of the Liberal Party, finishing second in June 1984 to John Turner (1929–), who took over as prime minister. Chrétien was appointed deputy prime minister and secretary of state for external affairs. Later that year the Liberals under Turner lost badly to Brian Mulroney's (1939–) Conservatives. Chrétien returned to private law practice in 1986. After Turner's resignation in 1990, Chrétien again ran to become the leader of the Liberal Party, this time winning easily. The media criticized him—he was labeled "yesterday's man"—and a long illness in 1991 interfered with his work. In the national election of October 1993, however, experience showed, and the Liberal Party was returned to power, with Chrétien assuming control as prime minister. His first months were marked by efforts to promote honesty in government and to make budget cuts. In 1995 Chrétien helped defeat the Quebec Referendum, yet another attempt to make Quebec a separate entity from Canada. He was reelected in 1997. Between 1994 and 1997 Chrétien had cut Canada's budget deficit (the amount by which spending exceeds income) by 70 percent, and by 2000 the country had a budget surplus (money available to spend). In September of that year Chrétien announced a $23.4 billion ($16 billion U.S.) increase in health care spending, as well as improved monitoring of the quality of health care. In November 2000 Chrétien and the Liberal Party won a larger-than-expected victory in elections, and Chrétien became the country's first leader since 1945 to win three straight elections. During the campaign Chrétien was accused of using his influence to help his friends receive business loans, but a police review of the charges concluded that there was not enough evidence to proceed with an official investigation. There was speculation that the charges and Chrétien's advancing age might lead him to resign, but he announced that he intended to continue as prime minister. In spring 2001 Chrétien attended the Summit of the Americas in Quebec City, Canada. During this meeting, thirty-four leaders of Western countries discussed such policies as creating a free trade agreement, working to improve education, supporting democracy, fighting against the illegal drug trade, and working to improve people's living conditions. After the terrorist attacks on the United States in September 2001, in which hijackers took control of jetliners and crashed them into the World Trade Center and the Pentagon, Canada sent troops to aid the United States in its fight against terrorists in Afghanistan. In March 2002 Chrétien met with U.S. president George W. Bush (1946–) to discuss Canada's continuing support in the United States–led fight. During this meeting Chrétien directed a comment toward the United States from Canada: "We are your neighbors, friends, and family. We have to work together. This problem concerns all nations of the world." Chrétien, Jean. Straight from the Heart. Toronto: Key Porter Books, 1985; revised edition, 1994. Martin, Lawrence. Chrétien. Toronto: Lester Pub., 1995.